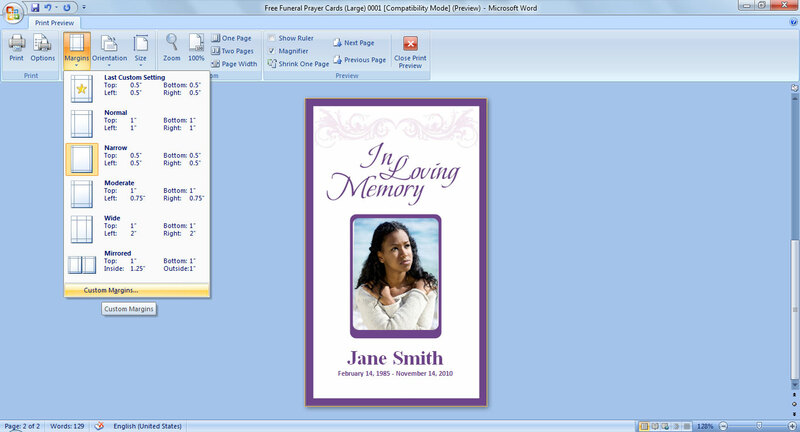 Online Funeral Templates sells funeral programs, pet memorials, thank you cards and other memory templates. A template is a document that serves as a guide for you to create your own program on your home computer. You just need to purchase a template from our site, download it to your computer, insert your pictures and content, save, and print out. You can print out as many copies as you need at home or send to a local professional print shop. We have printing services available too. 2. What software programs do I need to use your templates? You will need Microsoft Word any version (1997-2000, 2003, 2007, 2010 or higher) to use our templates (NOT Microsoft WORKS). If you do not have Microsoft Word installed on your computer, you may be able to download a trial version from the Microsoft Website. 3. I have a MAC, can I use the templates? Yes...our templates work with MAC. You just have to have Microsoft Word 2002 or higher, or any Microsoft Word Compatible Software (Like Apple Pages). 4. Are your templates easy to use? Yes! If you are familiar with Microsoft Word, than you can easily use our templates. Since the templates are pre-formatted, all you have to do is open the template, click in the textbox and replace the text with your information and insert your photos. ALL TEXT is customizable. 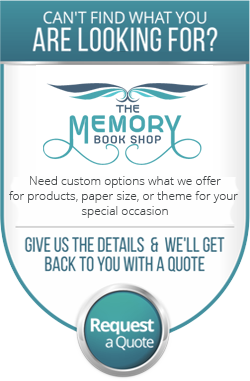 Add names, poems, scriptures, quotes, an obituary, order of service, photo collages and anything you want. Be as creative as you want to be. Have fun with it! 5. What can I change on my template? 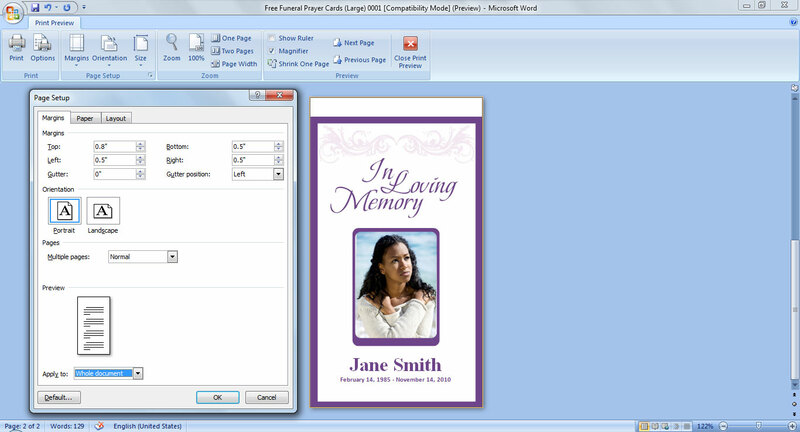 You can change ALL TEXT on our Funeral Program Templates. Feel free to change the title of your program, add photos, change font types, font size and color , etc. 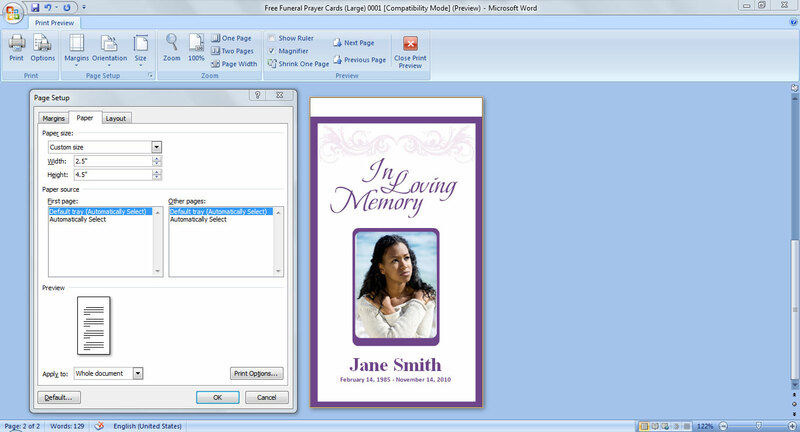 Our templates are created in Microsoft Word, so you can use all of the functionality that comes with that program. The designs and backdrops of course are pre-set, so if you need a more customized design, we offer that service. See Services. 1. Double click on the cover page image, which needs to replace image with your image. a. If you are not able to select IMAGE, then it can possible that FRAME & IMAGE can group, so first UNGROUP and then Select IMAGE. b. It also can possible that you can select FRAME but not IMAGE, if this situation then select FRAME and press TAB. 4. The Select Image you want to "Insert"
1. Go to "Print Preview" (Screenshot 1). 2. Click "Margin" => "Custom Margins" (Screenshot 2). 3. Change Margins "Top - 0.8 Inch" (Screenshot 3). 4. Paper Size "Height - 4.5 Inch" (Screenshot 4). 5. and then Click "Print"
8. Do I need a special printer to print? No, our templates print on any standard ink jet or laser printer. 9. Is your payment portal safe? Yes, your payment and personal information is secure with us.. Our payments are handled by PayPal, which is one of the most well-known payments processing companies. You can either pay using a PayPal account, or you can pay directly with your credit card. Both methods are secure methods of payment. We have several safeguards in place including a SSL (Secure Socket Layer) to encrypt any personal information sent. You can always purchase with confidence at Online Funeral Templates knowing your information is safe & secure. Information you transmit to Online Funeral Templates is never sold to third-parties. Information we collect is only used to process your order. For further information please see our Privacy and Security Policy. 10. When can I retrieve my template(s)? You will receive your template within minutes of your download. You will receive an email from us with your order details immediately after payment is processed. If you are experience problems getting your template, please Contact Us. 11. Can our purchased Templates be re-used? Yes, you can use your templates over and over, as many times as you would like. 12. 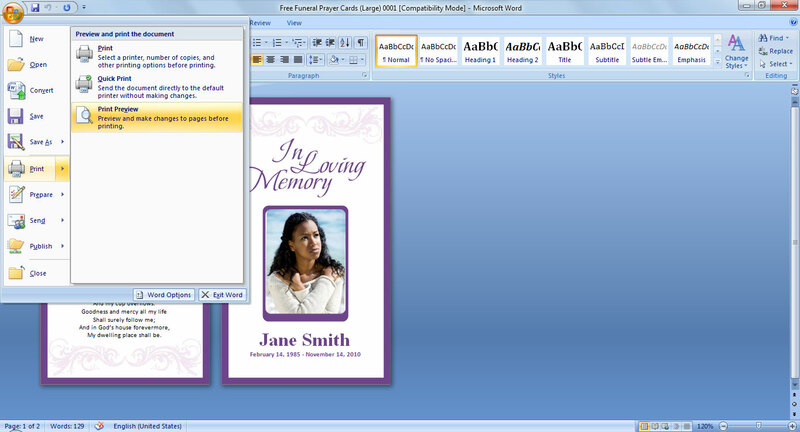 Can I add additional pages to my booklet templates? Yes! Our templates are set up for 2 or more printed pages, the front cover, and the inside pages. However, you can add additional pages if you need more space. Just copy the entire inside page and paste as many times as your need to in multiples accordingly to that template. Have a question that’s not listed? No Problem. Email us.